Las Palomitas Subdivision is in the central part of the North Area of Tucson, AZ. This Tucson subdivision is north of Sunrise and west on Pontatoc Roads. The Catalina Foothills High School is minutes away. And shopping, restaurants, and activities are nearby at La Encantada This shopping plaza has many name brand stores and great restaurants. 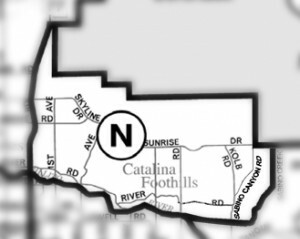 Families living in Las Palomitas Subdivision are served by the Catalina Foothills School District – District 16. Restaurants to visit if you are living in the Las Palomitas Subdivision or another subdivision in Tucson’s North area are the The Grill At Hacienda Del Sol and Flying V Bar & Grill. Considering A Home In Las Palomitas Subdivision? Are you thinking of buying a home in the Las Palomitas Subdivision or another area of Tucson area? Finding the right home can be a challenging process. But having the right Realtor makes a huge difference. And we will make the process much less stressful for you. Thinking Of Selling Your Home In Las Palomitas Subdivision?